PAUL WHITE reviews North East musician Mike Ross on a return gig to the region. Back in the late 90s, I had the pleasure of writing about live music for The Northern Echo. While the opportunities to interview the likes of Bon Jovi drummer Tico Torres, Gerry Marsden, Terrorvision, Deacon Blue and many more was fantastic, what I really loved was seeing local bands play live and be well-received by decent-sized audiences around the Darlington and Durham music scenes. One band that I maintain to this day to be one of the best and most exciting bands to see live was Taller Than, a three-piece outfit from the Sacriston and Lanchester area. Playing their own music as Taller Than, often coupled with covers sets as the Popular Beat Combo, they were regulars at the likes of O’Neills in both Durham and Darlington, and the Filibuster & Firkin in Darlington, along with many more venues around the region. In 2000, they played their last gig in Darlington before moving to the Brighton area, where all three members are still active in the music industry. 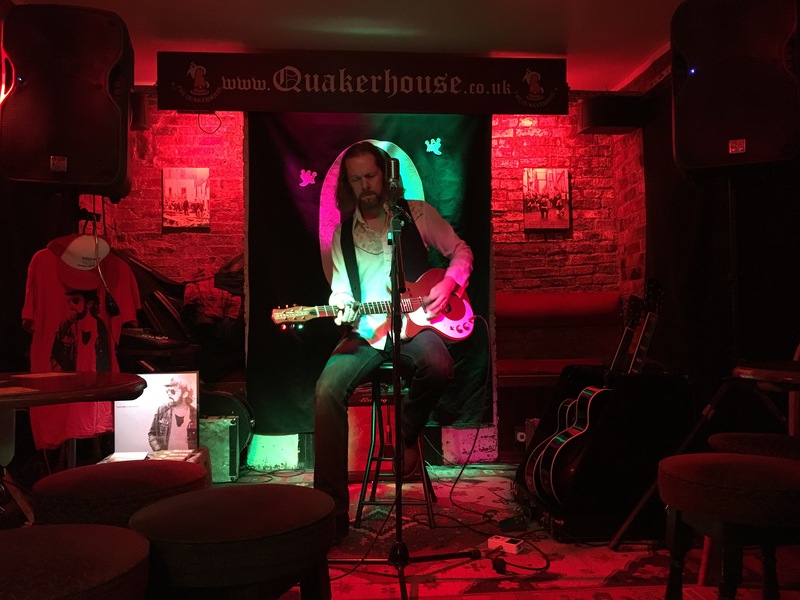 Sixteen years on, singer and guitarist Mike Ross returned to Darlington on Sunday night for his first return gig in the town, playing a two-set late afternoon session at The Quakerhouse. Normally fronting the Mike Ross Band, Mike stripped back a range of his own numbers and covers, without losing anything in his simple guitar and vocals arrangements. Opening with a Credence Clearwater cover, he quickly got the audience onside before heading into the latest version of an old Taller Than number, Questions, and mixing his own tracks like Ran Thru Here and Statesboro Blues with his own cover of Aretha Franklin’s Baby I Love You, which appears on his latest album, Jenny’s Place. The hugely appreciative audience in a venue I had forgotten how much I like, complete with a great selection of real ales – right up my street – were ready and waiting for a second set to follow the break. Set two opened with a version of Stephen Stills’ Love The One You’re With and took a blues journey through Robert Johnson and Willie Dixon, before dipping into Mike’s Spindrift debut album for Don’t Worry Baby Just Call, then returning to the familiar for the audience, with Johnny cash’s Get Rhythm, Marvin Gaye’s Heard It Through The Grapevine and more. Closing the show with his own Bamboozled, Mike left the audience happy at the close of his mini North East tour and promising a return to the region in the Spring. It was a great way to remind myself just how good Mike Ross is and what a great venue The Quakerhouse is, as well as what a hotbed of great musical talent the North East is, whether or not you’ve heard of many of the acts.